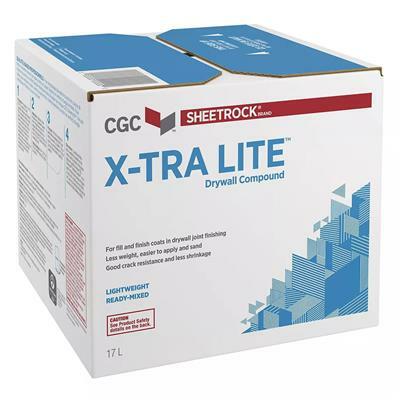 The CGC SHEETROCK 17-Litre X-Tra Lite Lightweight Ready-Mixed Drywall Compound is a ready-mixed, high performance easy-to-use compound that weighs up to 35% less than conventional-weight compounds. It's lightweight formulation makes this product easier to handle and apply and sands very easily for better productivity. It is ideal for filling and finishing joints, fasteners, bead and trim. CGC Sheetrock® Brand X-Tra Lite™ Drywall Compound is also excellent for skim coating.